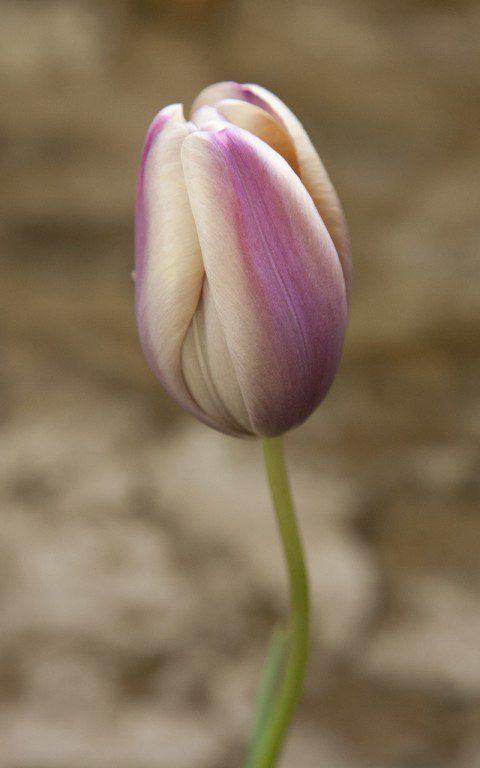 Tulips – Dig Delve – An online magazine about gardens, landscape, growing & making. 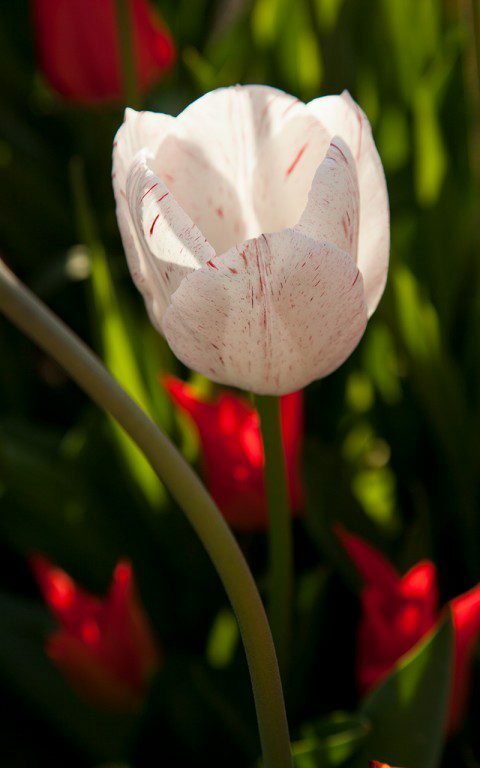 The tulips are finally over or, more to the point, we are taking control this weekend and will bring their extraordinary display to a close by lifting the bulbs and clearing the bed. As is the way with Christmas decorations, I feel almost as much pleasure in finally stripping away their ornamentation after the period of illumination and, for a moment, for there to be quiet. And, with the cool, dry weather this year, they have been flowering for a full six weeks. 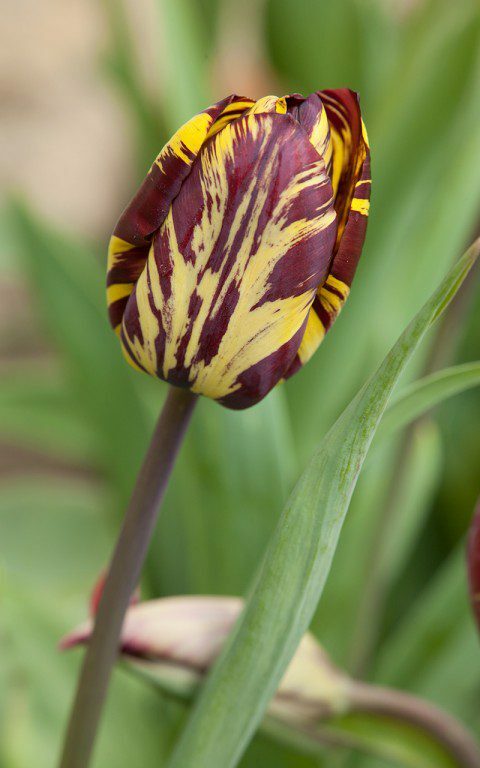 We started growing tulips in earnest in the garden in Peckham, ordering a handful of varieties to fill the pots on the terraces. 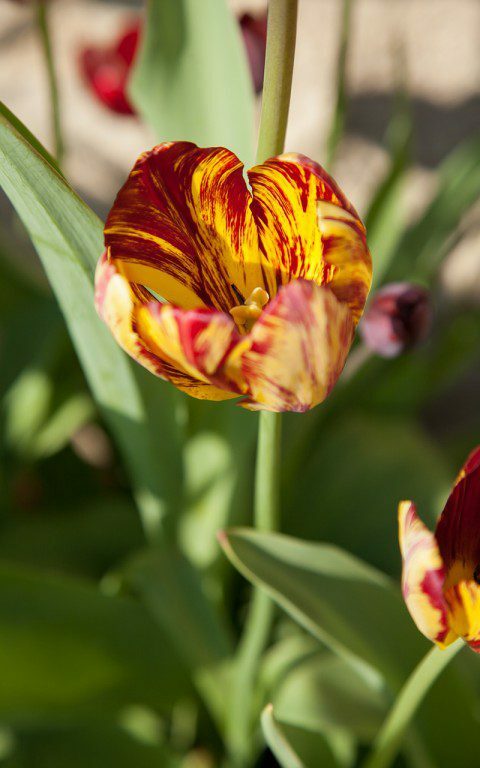 Each year, a favourite was kept on to get to know it better and winkled into the beds to see if it would last in the ground. That was how we discovered that we preferred ‘Sapporo’ to ‘White Triumphator’, for the fact that it ages from primrose to ivory, and it has been hard to match the perfume and vibrant tangerine of ‘Ballerina’. 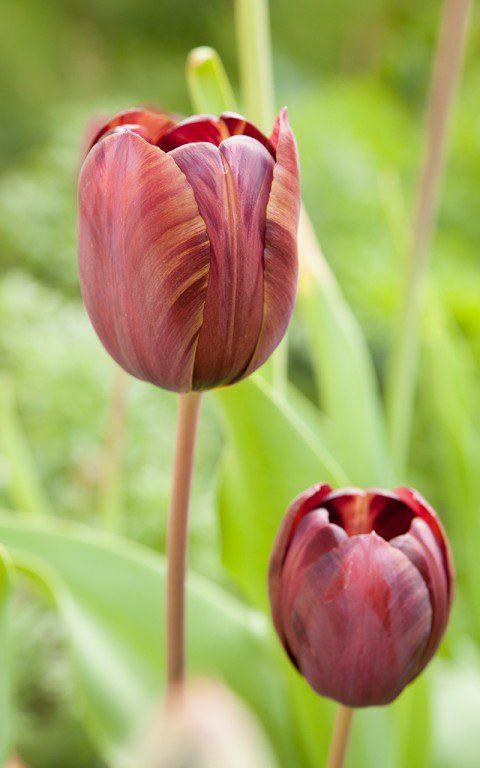 When we moved here we continued to experiment, upping the number of varieties and planting the tulips in rows in the vegetable garden to slowly build an armoury of favoured varieties. 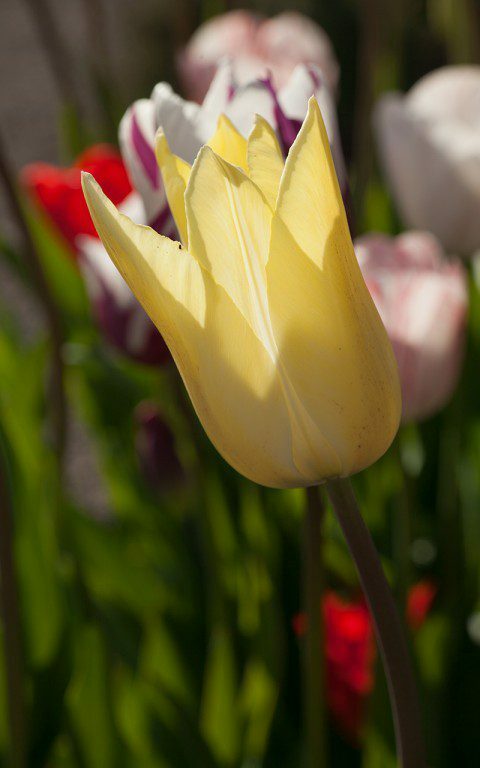 As we became more confident with our experimentations and learned how to extend the season by including early, mid and late season tulips, we began a to grow them altogether differently. I was in the process of planting up a client’s walled garden and, for cutting as much as display, we created a series of mixes to play with the sheer breadth of varieties. We chose colour combinations to conjour a series of moods and colour fields, some dark, some pale or pastel, but always with a top or bottom note of vibrancy or depth to offset the predominating mood. The flowering groups were combined together to lengthen the season so that the early varieties were covered for by the late, and short with tall so that the combinations were layered. We also included differing types – doubles, parrots, flamed, fringed and picotee – for that sweetie box feeling of delight in variety. At home, this has now become the favoured way of keeping up the experiment. 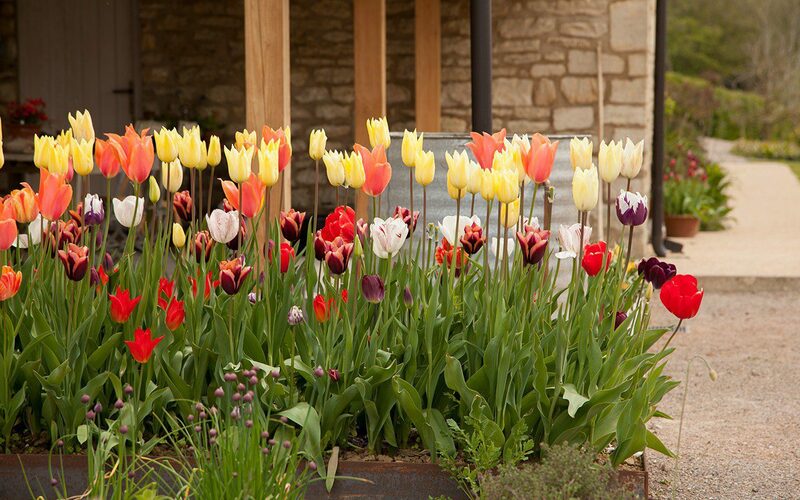 Each year we buy thirty or fifty bulbs of up to eight varieties and dedicate a bed in the kitchen garden exclusively to a spring display. We have moved them from bed to bed to avoid Tulip Fire. 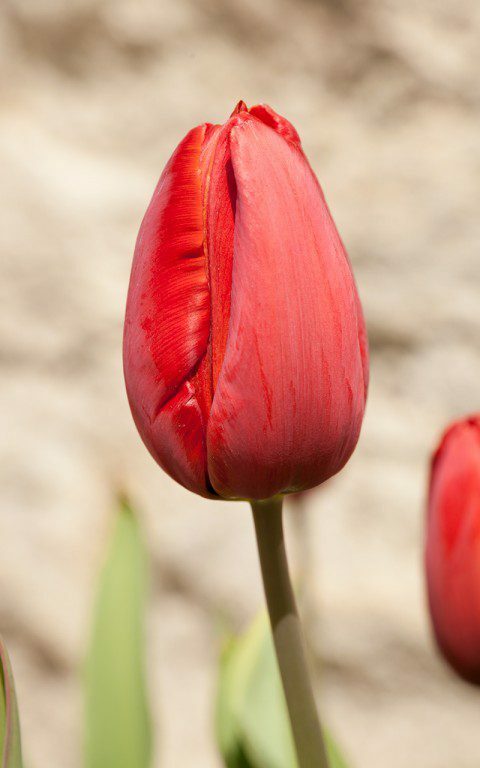 Tulips are most prone to the fungal infection when repeatedly grown in the same ground, but rotate on a three or five year cycle and you will diminish the chance of infection. 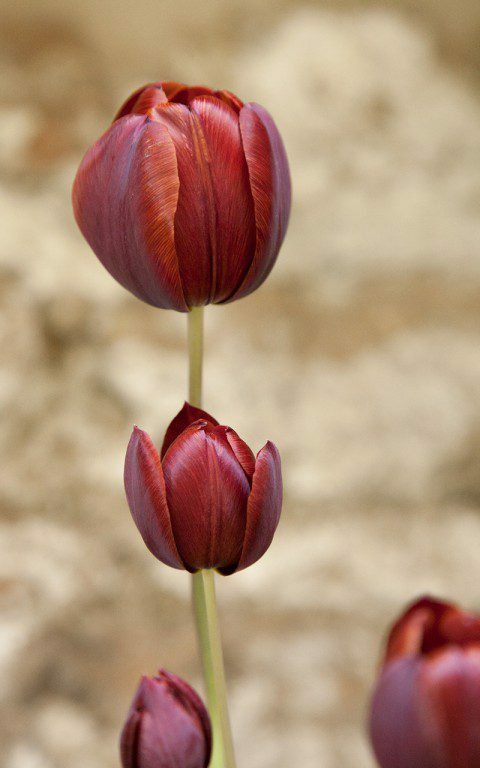 In combination with our thirst to try new varieties, it has also been the reason that, at the end of the season, we discard the bulbs and start again with a new batch for November planting. The bulbs, which are cheap enough to buy in quantity wholesale, are planted late at the end of the bulb planting season. They are debagged and thoroughly mixed on a tarpaulin before being spread evenly on the surface of the bed and winkled in with a trowel a finger’s width apart so that they are not touching. 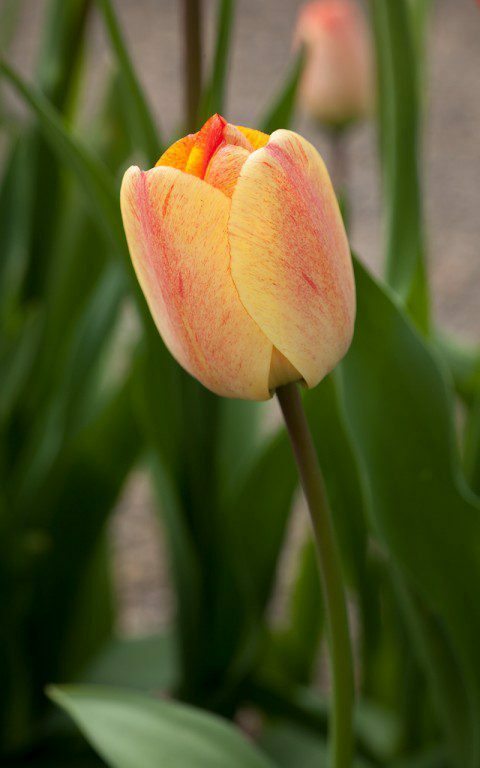 This year we have also started growing the Broken and Breeder tulips from the Hortus Bulborum Foundation. 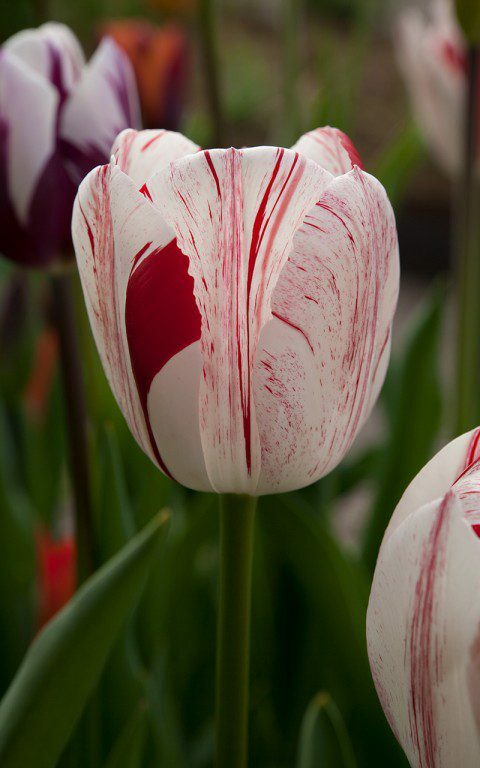 This range of old varieties – some of which date back to the 17th century – fell out of popularity in the 1920’s because, in the main, they are late flowering, and the quest for colour to break with winter began to favour the earlier flowering varieties. 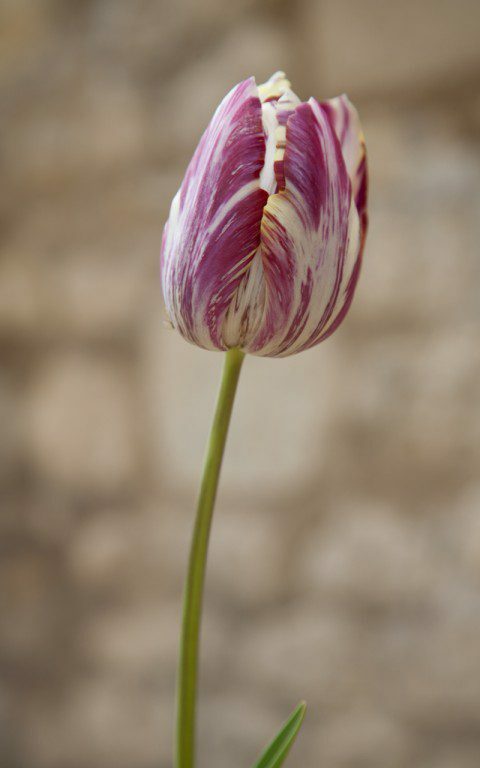 Their lateness has been a delight, as they have come just as we have begun to tire of the resilience of the modern tulips. Because they are choice (and expensive) we bought just three or five of each, combining them in pans and planting an individual specimen of each in 5 inch clay pots, so that they could be brought into the house for close observation. Inside, they last for a week in a cool room and continue to evolve whilst in residence, their more subtle colouring, feathering and breaks filling out and flushing in the maturing process. 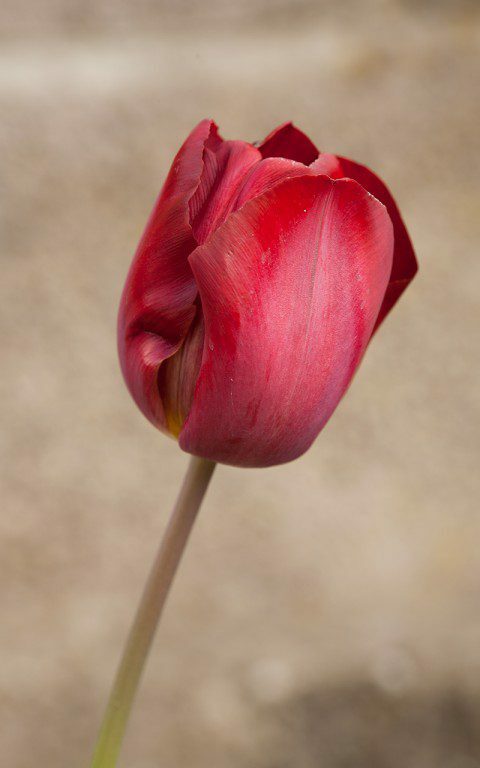 They feel precious and not disposable like the Dutch tulips, so we plan to try and keep the bulbs when they are over. 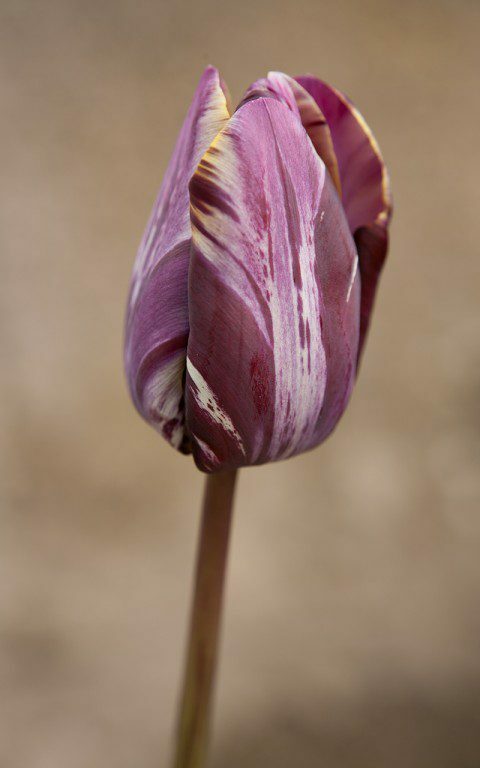 I will grow them on to feed the bulbs for six weeks after they have flowered, before drying and storing the bulbs in the shed until the autumn. I am hoping they will come to more than just leaf next year. 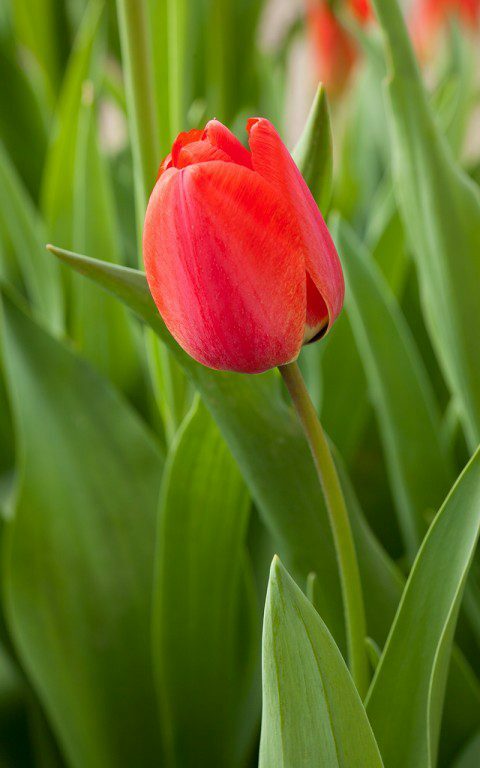 As cut flowers tulips continue to grow, their stems often lengthening as much as a foot or more in a tall-flowered variety such as ‘First Proud’. This has been a new favourite this year, rising up to 90cm; as tall as, but later than, ‘Perestroyka’. A mixed selection of varieties is also good in a bunch and, as they age, the stems arch and lean, sensing each other it seems, so that a vase full will fan out like a firework exploding. The flowers change too, opening and closing with the heat and light and changing colour, sometimes intensifying, sometimes bruising from tone to tone as they fade. The mercurial colour changes are the most interesting and offer far more in terms of value than those that change less, and a new personal favourite this year has been ‘Gudoshnik’, the flowers of which you would swear were different varieties; some are pure vermilion, others red with yellow feathering, others yellow with red streaks. We have also enjoyed the raspberry ripple breaks and freckling of ‘Sorbet’. If you are experimenting as we are the mixes can be hit or miss, and this year’s wasn’t one of the best, because we didn’t warm to a couple of varieties that have thrown the colour off. We won’t be growing ‘Zurel’ again. The flowers are boxy, the petals stiff and waxy and the flaming is rather coarse. ‘Slawa’ was worth a try, because it looked interesting when we ordered from the catalogue, but it felt too graphic in the mix. 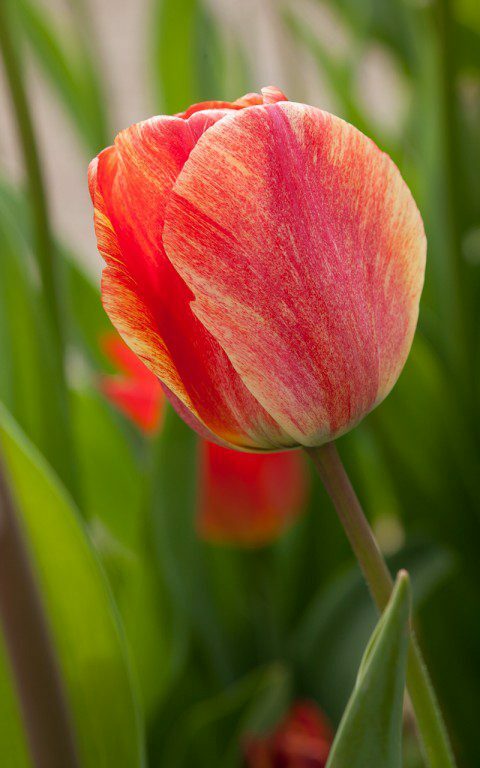 The colour combination of peach and plum needs careful placing, and the flowers are less graceful than some. Harsh criticism, perhaps, but a good combination is easily let down by an element that isn’t quite right. The less successful varieties were also shown in a new light by the older varieties. 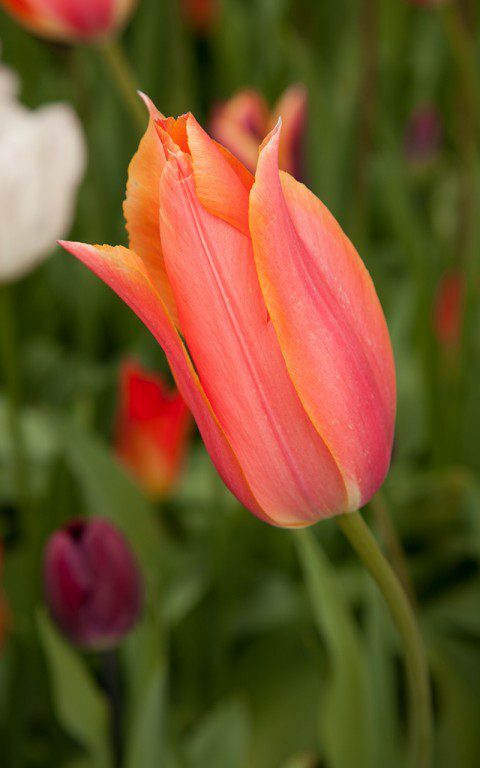 The breaks, feathering and flaming of the Broken tulips, and the rich tones and pastel gradations of the Breeder tulips are altogether more sophisticated. Put side by side the latter are certainly a rather superior race. Not without their problems I’m guessing, because they are less robust in appearance when compared to the modern hybrids. 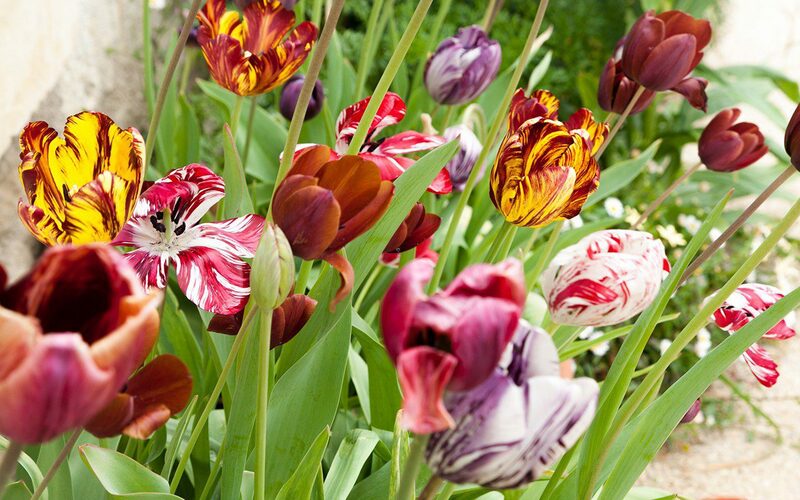 Particular favourites have been ‘Insulinde’, streaked the colours of blackcurrant fool, ‘Marie Louise’, a Breeder of a delicate, graduated lavender pink, ‘Panorama’, a Breeder of a strong copper orange and ‘Absalon’, a Broken tulip (and one of the original Rembrandt tulips) which has ranged from the flamed, blood-red and yellow you see in illustrations to a more subtle mix of mahogany streaked with tan, like an old-fashioned humbug. Though we have heard much about their growing popularity, seeing them in the flesh has been a little like discovering really good chocolate. I fear we have now been spoiled and it won’t be possible to be without them.